When I talk to readers, I often tell them that family history is one of the inspirations for the themes and plot elements in my novels. Way back when, before any of my books were published, I posted a collection of family stories on an older website. Now it's time to bring them back from the Archives and identify the ones which found their way into Three Souls and Dragon Springs Road. D ragon Springs Road takes place in the 1910s, when upper-class Chinese society adopted Western clothing, music, housing, and cuisine. They sent their sons to be educated in Japan, America, Europe. Their daughters attended schools with British teachers. It was a mish-mash of cultures as China struggled to modernize and much of the modernity was superficial. Families still arranged their children’s marriages, and looming above every woman, no matter how modern the family, was the pressure to produce an heir. When I first posted this story, I hadn't written Dragon Springs Road yet; but during the writing, this unfortunate long-ago relative's story ended up in the novel. I'm sure you'll recognize the character inspired by this story. There is a story told in our family about an unfortunate female relative. Her name has been forgotten, and we don’t know exactly when she lived, but that matters very little because it is a tale that could be from any part of China. It could be hundreds of years old or from only a few generations ago, yet it can always make women shudder with pity. This many-times-great-aunt was married to the eldest son of a strict and proud family. After five years and not even a hint of pregnancy, it became clear that she suffered from the curse of infertility. All the herbal remedies and nourishing broths she consumed to balance her body’s energies proved futile. One of the temples in our ancestral town of Pinghu boasted a Goddess of Mercy with a reputation for being particularly benevolent towards barren women; but no matter how much incense the unfortunate woman burned at the altar or how many offerings she made to the Goddess, pregnancy eluded her. Impatient for heirs, her husband’s family urged him to take a concubine and get down to the job of producing sons. In fact, his grandmother recommended that the family forgo the dowry this time and find a woman of lower class and stronger loins, unlike our many-times-great-aunt,who was highly-bred, somewhat nervous, and melancholy of temperament. The matchmaker brought in a plump and soft-spoken girl from the village, and in due course babies began to appear with predictable regularity. Great-aunt suffered even more now that she had been displaced by this fecund second wife. What made it even more demoralizing was that despite her humble upbringing, the once-servile village girl had begun giving herself airs; although officially only the second wife in rank, she was now being treated with great favor by her mother-in-law. During her pregnancies, expensive and nourishing foods were brought to the table especially for the mother-to-be. A little peasant girl was assigned as maidservant to keep the concubine company at all times, and to fetch and carry so that she would not tire herself out. Each new garment she appeared in was more embroidered than the last, and her hair ornaments, once cheap tortoiseshell and brass, were now inlaid with coral and tiny pearls. There was worse to come: one day it was the concubine and not Great-aunt who was asked to take tea with her husband’s grandparents in the gazebo by the goldfish pond. With that, poor Great-aunt knew she had been demoted. Her only remedy was motherhood, and in her distress she turned to faith healers and priests for more drastic remedies. But potions, pilgrimages and prayers all came to naught for Great-aunt. Finally, during one of her regular visits to the temple, she fell into conversation with an old nun. The wrinkled old woman told her of a solution: she needed to make a special offering to the Goddess of Mercy. If Great-aunt were to embroider an altar cloth with the images of a hundred baby boys, all in different postures and activities, then she would become pregnant and furthermore, the child would be a boy. Great-aunt fell to this task with a desperation that drove her needle flashing through heavy silk like fish leaping in a lake. An assembly of laughing toddlers began to emerge beneath her thin fingers: playing with a ball, chasing butterflies, spinning tops, eating oranges. The images of the babies she longed for in her mind were painstakingly stitched in bright thread. The project took more than a year of concentrated effort and became the focal point of her life. She presented the altar cloth to the temple and retreated home to await the promised miracle. After a year of waiting,Great-aunt fell further into despair and melancholy, and shamed her family even more when she was pronounced mad. What finally became of this many-times great aunt we do not know, because the family does not like to talk about unfortunate ancestors. Sometimes when we tell the story, we even add that really, she was only a very distant aunt. This story took place during the golden years of the Qing Dynasty, during the reign of the Kangxi Emperor (1662 – 1723). In those days a man could divorce a woman for failing to give him sons, but it was more common for the man to take a second wife or concubine, especially if the first wife was from a family of equal or greater social standing. The Kangxi Emperor’s contemporary in England was Queen Anne, the last of the Stuart monarchs; she had eighteen pregnancies but died childless. This story speaks to me of so much that is wrong with traditional Chinese society and I blame it all on Confucius. But there are many other societies that marginalize women, all without the benefit of Confucian teachings, so obviously I need to use a wider lens on this topic. Not that there isn’t enough material about the oppression of women in Chinese culture to fill several sets of Encyclopedia Britannicas. 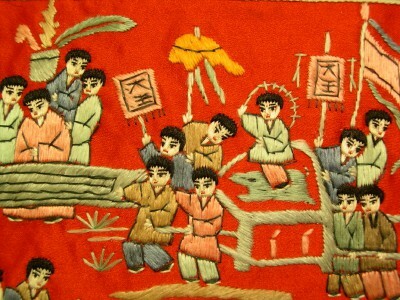 It certainly casts a different light on the embroidered cloths you find in Chinese temples. Oh how sweet, you say when you first see one. One hundred cute little baby boys. This story reveals the desperation behind all that needlework. A son made all the difference to a woman's status, to her value as a wife and daughter-in-law. Even servants could treat a barren wife with contempt and get away with it.